The father penned Carrie, Cujo and The Shining, best-selling novels known for their horrific plot twists and bloody conclusions. The daughter went to seminary. She spends her time soothing souls and enjoys knitting and foraging for mushrooms. Did the apple fall far from the tree? Not really, says the Rev. Naomi King, the newly minted minister at the River of Grass Unitarian Universalist Congregation in Plantation. She says she and her father -- the godfather of all things gruesome, Stephen King -- are actually kindred spirits. ''We're both storytellers,'' King said from her new office, a large space packed ceiling-to-floor with books. Naomi King, 37, wears round glasses and prefers her dark hair pulled back in a tight bun. She preaches Unitarian Universalism, a theologically liberal doctrine. The religion does not have a specific creed and its traditions stem from multiple faiths. Some congregants believe in God, others don't. Some identify themselves as Christians, Jews or Buddhists; others as pagans or humanists. It's a religion King found later in life. The oldest of three children, Naomi King was born in Bangor, Maine. When she was young, her father made ends meet by submitting his short stories to men's magazines. But around the time of Naomi's second birthday, Doubleday Books published Carrie, Stephen King's novel about a teenage girl with telekinetic powers. It became a bestseller, then a high-grossing movie. Dozens of book contracts followed. Stephen King's imagination wasn't lost on his only daughter. Naomi devoured books, especially anything written by C.S. Lewis and J.R.R. Tolkien. She and her two younger brothers always anticipated their father's stories. But more often than not, Stephen King spun less-than-scary stories for the kids. In fact, it wasn't unusual for the family to read the Bible aloud together. By the time Naomi King was a teenager, her father's celebrity made it difficult to go out in public, she said. Still, she enjoyed pointing out his titles in bookstores, even if people doubted her connection to the author. Naomi King came to Unitarian Universalism as an adult. A restaurateur at the time, she had been advocating for gay rights -- and in doing so, fallen victim to threats and tire-slashings. King was drawn to the religion's teachings of justice, equality and compassion. Four years later, she said, she had a mystical experience. Days after she underwent a serious operation, more than 100 members of her congregation told her they had envisioned her becoming a minister. At first, she wrote it off. But as more and more came forward, she started listening. King enrolled in the Meadville Lombard Theological School, a graduate program for Unitarian Universalist ministers in the Chicago area. Just before beginning her studies, she met Thandeka, a theologian and professor at the school who was given the one-word name by Archbishop Desmond Tutu of South Africa. King and Thandeka fell in love and were later united in a Unitarian Universalist ceremony in Nashville. She graduated from the seminary in 2005. King says her family wasn't too surprised by her new vocation. ''Telling stories is kind of like the family business,'' she said, laughing. Her mother and two brothers are published authors. Her brother Joseph King, who writes under the pen name Joe Hill, penned the bestselling novel Heart-Shaped Box. Naomi King, however, says she'll stick to sermons. Earlier this month, King began at River of Grass, a congregation of about 120 members in Plantation. The selection process was intense: Over the course of several weeks, King made several visits, gave a sermon and interviewed with the board. In the end, the congregation chose her unanimously. King says she's equally pleased. 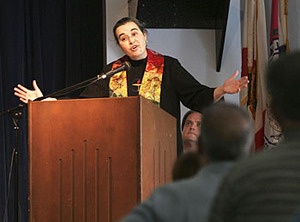 On Sunday morning -- wearing a long, black robe and a rainbow-colored stole over her shoulders -- King took the pulpit at Central Park Elementary, the Plantation school where the congregation gathers for Sunday services. For the time being, the congregants transform the cafeteria into a place of worship. After the hourlong service, which included the songs Scarborough Fair and Cat Stevens' Moonshadow, King met the worshipers for coffee. ''I'm looking forward to working with this wonderful group of people and making South Florida my home,'' she said. The River of Grass Unitarian Universalist congregation meets Sundays at 10:30 a.m. at Central Park Elementary School, 777 Nob Hill Rd., Plantation.